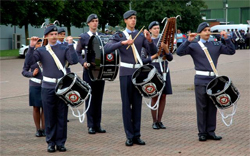 Throughout the year the squadron has many engagements where the band will need to rehearse during the day and before 2015hrs on a parade night. We do understand that this could affect some nearby residents so we will be publishing the dates and times of our practices (which occur outside normal parade nights) on this page for your information. If you do have any queries and wish to discuss these, please do not hesitiate to contact us.